There aren’t easy answers to a lot of these questions, so we have to do a little thinking, a little deeper study of the Word, and more praying. I’m also speaking as a parent of young kids living in a regular ol’ suburban neighborhood full of other young families. Perhaps you live in dangerous neighborhood where Halloween gets out of hand. Maybe your experience of Halloween involves all sorts of drunk and disorderly behavior that you want to avoid. Or maybe you grew up in environments where spiritually evil things were celebrated and you have an aversion to participating in that sort of thing, even the dialed-back versions of kids dressing up as Iron Man. That’s all fine. If you feel the need to avoid Halloween, there is a scenario in I Corinthians 8 that is pretty much parallel. In that chapter, Paul (basically) says it’s good to avoid a situation if your conscience says you should. But I think a majority of Christians in the USA experience October 31 in roughly the same way: kids from around the neighborhood dress in fun, fancy, or scary costumes and come wandering up to your door, ring the doorbell, and say “trick or treat!” expecting you to drop a handful of Starburst and Snickers minis into their plastic pumpkin buckets. If that describes your Halloween experience, and you would like to get a little better at loving your neighbors and honoring Jesus this October 31st, this article is for you. There are plenty of articles and blog posts that discuss the merits and/or evil of participating in Halloween as Christians. Aside from a few extreme cases, most level-headed writers and bloggers tend to land somewhere in the middle. The general consensus is that we should take the good and leave the bad. Enjoy giving and receiving, have fun dressing up in cute costumes, and use it as a time to reach out to your neighbors and show the love of Jesus. Avoid nasty, weird, gory, demonic stuff. There is plenty of that around, and the Bible is clear that it’s real, but the devil and demons do not have power over Christians. Still, we should probably avoid going in to areas or events that purposefully celebrate the witchy horror side of Halloween. Seems like good, basic wisdom. 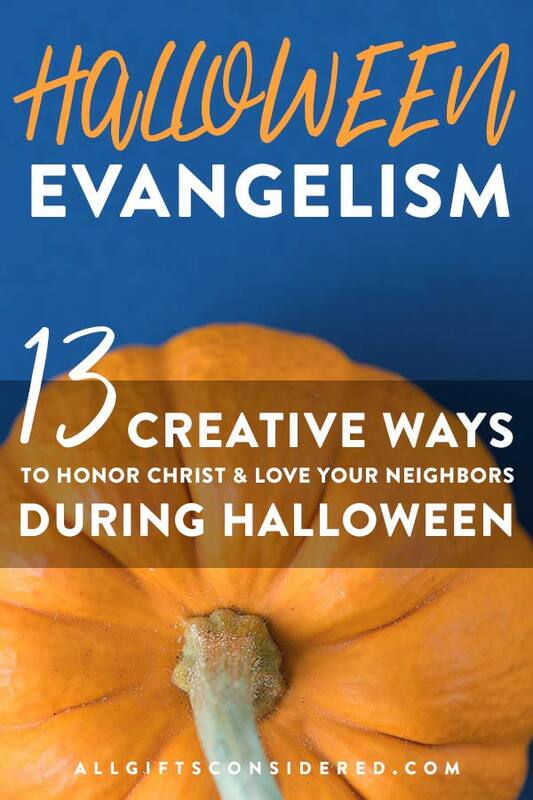 So without getting to far into the Christian/Halloween “debate,” I’m simply going to dive in with some very practical and sometimes creative ideas on how we can honor Christ and love our neighbors on Halloween. And yes, this will include Halloween evangelism ideas. If you want a little more depth in your understanding of how Christians can honor Christ in the culture, I recommend Rod Dreher’s The Benedict Option, which is a thoughtful manifesto on how to build a holistic Christian culture from the ground up. For a practical resource on how to raise a family that reflects the light of Christ, Organic Family Outreach by Kevin & Sherry Harney is a solid choice. And for evangelism via hospitality you can’t go wrong with The Gospel Comes with a House Key by Rosaria Butterfield. Ok, without further ado, here’s the list. I pray this is helpful… soli deo gloria! Seems obvious, but sometimes it is important to draw attention to simple ways we can show neighborly love. For instance, make sure your walkway is clean, swept, and well-lit. Mark potential trip spots where a tree root grows or where the cement is uneven. Don’t overdo it with scary decorations and sound effects. Some people think it’s fun or funny, but families with young kids will skip your house if it’s too spooky. Open the door with a smile. Buy lots of good candy and give it away generously. Ask the kids what they are supposed to be, or, better yet, learn what’s “in” this year and impress them by identifying which Pokemon or Marvel character they are. Talk to people. Give out surprise bonuses like chalk, slime, Tamagotchi pets or squishy stress toys. Again, find out what the kids are loving these days… a few years ago it was fidget spinners, this year it’s slime, next year who knows, maybe Pogs or slap bracelets will come back. These are little but meaningful ways to show the love of Christ to those who come to your door. When kids come to the door, introduce yourself while you’re handing out candy, and ask what they are supposed to be. Don’t ask their names, as that would come off a little a lot creepy. If their parents are with them, introduce yourself to them first. When you’re out with your own kids, most parents tend to hover by the curb while their little ones trudge up to the door. If you find that you are walking along with some other parents, introduce yourself and get to know them a bit. People tend to be a little more friendly and open to conversation on nights like this. If it doesn’t seem weird, ask if they live in the neighborhood, maybe try to set up a playdate if your kids are similar ages and seem to be getting along as they trick or treat. For some houses, the occupants enjoy sitting out in their driveway with a big bag of candy. These are the types who really enjoy the night, so they will probably chat with you if you introduce yourself. If you’re intentional about getting to know people, remembering names, and trying to connect with those around you, Halloween could be the night in which you begin some long-lasting and God-honoring friendships. Maybe there is someone in your life you would like to get to know better: a new neighbor family, a co-worker who lives out in the country, a family from church you don’t know well, or your children’s school friends. Invite them to go trick or treating with your family. Especially if your neighborhood is one of the “prime” spots! This is a great opportunity to get to know someone a little better as you walk around the neighborhood together. As you develop relationships, the opportunities to show love, witness, and engage with the people around you will grow. This is a fun way to be creative with your costumes, plus it’s fun to see people’s reactions when they ask what you are. Your kids may learn a bit about the background culture of biblical times, and it is an opportunity to help them see how to read the text carefully. God can, has, and does use tracts to draw people to himself. Low effectiveness ratings or mildly annoyed eye rolls shouldn’t dictate what we do. People are coming to your door ready to receive a gift from you, and there’s no reason you shouldn’t bless them with the Good News. Just make sure you back it up with some great candy. Like, full-size or even King-size candy bars, Twinkies, cupcake pops, those old “home run pies”, stuff that will really stand out. After all, if we are representing a great and generous King, let’s make sure our candy-giving reflects him well. Bust out your camping table, decorate it with something fall-ish and festive, and set out a massive coffee dispenser along with paper cups for the parents. You’ll want to sit out there to supervise (because, let’s be real: people will destroy, abuse, or steal anything) and while you’re there introduce yourself to the parents, make conversation, tell people why you’re giving out coffee, and in general be nice and neighborly. Perhaps this will open the door for a relationship, and you should always be ready to share the gospel. After all, we can be gracious to others because he has been gracious to us! Always give out great candy, and have tracts, Bibles, and invitations to church ready as well. Grill hot dogs in your driveway! Set out chairs so that people can stay a while. Have a cooler filled with water bottles, or single-serve bags of chips to go along with the hot dogs. Just remember, if you do something like this make sure you get enough supplies! Word of free food can get around very quickly, and you don’t want to disappoint. This is a great idea that flips the trick or treat tradition on its head. Instead of knocking on doors to take, come to your neighbors with something to give. What better way to represent the grace of God! Give when others take; shine light in the midst of darkness. This is a wonderful teaching opportunity for your kids as well. Of course you don’t need to tell your kids that taking candy is wrong; after all, you shouldn’t rob your neighbors of the joy of giving either, and you probably don’t want your kids to associate the gospel with **not** getting candy while everyone else does. Rather, add some reverse trick or treating into your festivities as another way to spread the joy of Christ. Give out great big candy bars, bags of candy to help your neighbors restock, or free ice cream/coffee/donut certificates to local restaurants and coffee shops. Include a hand-written note with Scriptures and a tract, and most importantly tell people why you are so happy to give. The term “Halloween” is a contraction of “All Hallows Eve,” or “All Saints’ Eve.” This is the day before All Saints’ Day, which is still celebrated in much of the Christian church on November 1st. The basic idea behind All Saints’ Day is to remember the saints who have died and gone before us, and to celebrate Jesus’ ultimate victory over death. So you can see the connection already. Halloween – All Saints Eve – is when death and evil tries to take over, but the sun (Son!) rises and the eternal victory of the saints is assured. In its missionary labors in Europe, the church substituted its own holiday for some pagan observance. In the modern West, Halloween is essentially a mockery of ancient paganism. It is not paganism, but a celebration of the gospel’s victory over paganism. I see no spiritual danger in observing that celebration, as long as we, and our children, understand the difference between mocking paganism and endorsing it. The answer, of course, is yes – Jesus! It’s cute, you fill it with candy, it shows a little extra-special care, and the gospel is simply and clearly shared. Tracts like this can be great, especially because they share the gospel in a concise and attractive way, but even if you don’t do tracts, a hand-written note or tag on your candies can also go a long way and shows a more personal touch. Martin Luther posted his famous 95 Theses on October 31, 1517, and in so doing kickstarted the Protestant Reformation. It’s become popular in recent years among Reformed-types to eschew Halloween in favor of Reformation Day. It’s a fun tradition that revisits the historical roots of Protestant Christianity and highlights the importance of distinctives like justification by faith, the priesthood of believers, the “Five Solas” and more. Some folks do Reformation Day as a Halloween alternative, others do both. As a form of Halloween evangelism, I’d suggest throwing a Reformation Day party either earlier in the day or well after dark (in other words, before or after prime trick-or-treating time). Invite neighbors, friends, and family, and prepare a thoughtful explanation of Reformation Day that non-believers can follow. This should be short enough that they don’t feel like they’ve been duped into a gospel presentation but clear enough that it actually is a gospel presentation. An explanation in casual conversation around the activities will probably go over better than a full-on presentation, but hey – you do you. The days leading up to Halloween provide plenty of good excuses to give out special treats. If you have school-age kids, consider making up special goody bags complete with a tract or a personal note about how Jesus has conquered death to give out at football practice, chess club, gymnastics, Girl Scout meetings, etc. Get your kids involved in making and handing out the bags. 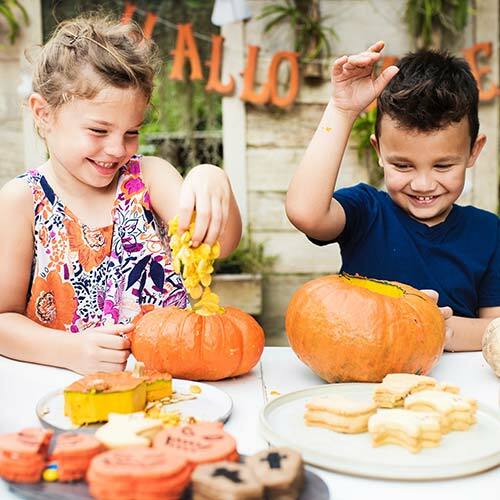 It’s fun for them to be the cool, popular bringer-of-candy, and while putting the treats together you can encourage them to think evangelistically about their friends and how they represent Christ to the world. Get a bunch of pumpkins and some pumpkin carving kits. Invite the neighbors and do it in your front yard so you can also invite passers-by. Grill hot dogs, offer coffee, cocoa, or punch, have chips and candy bowls out, and set up yard games like this Pumpkin Bean Bag Toss Halloween party game. Use your imagination, make it fun, and your place will be a destination for the neighborhood. Socialize with your neighbors and invite friends from your church to hang out and help evangelize. If God has given you children, they are the ones you should always focus on first! Don’t neglect discipling your own kids while you seek to evangelize others. Talk to your children about Jesus and his triumph over death. Teach them about life and death and the resurrection. Read them the Scriptures, remind them of his love and grace, keep the commandments before them. At the same time, tell them why and how you are reaching out to others. Get them involved in giving out candy and more. Teach them the gospel thoroughly, and prepare them well to be able to share the gospel with others. Pray with them for your neighbors. Show them how to live a Christ-saturated life that lines up with what you preach. 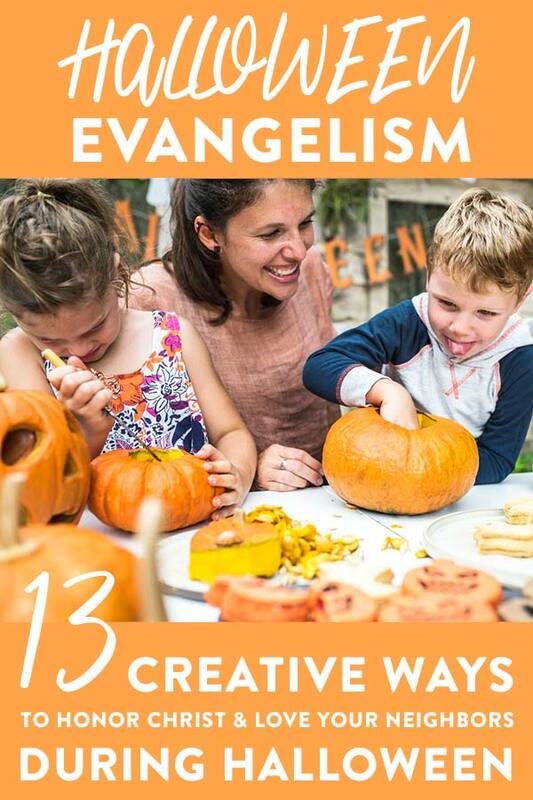 I hope these Halloween evangelism ideas inspire you to love your neighbors more, share the gospel in creative ways, and be a light for Jesus right where he has called you. If you have any other ideas, or ways to improve on these, please share in the comments below!